The Art Works is in its new home. Posted on Tuesday, May 2nd, 2017 at 1:18 pm. After months and months of hard slog, planning and organizing we are now finally in the new premises, and in control of our own future. It’s great to see it all come together; after all the thinking. planning and imagining, to see it come to life is a revelation. It is such a nice space to be in, which will really help as we spend a lot of time here. It will help with turning around work quickly, as it is a bigger and more efficient space to work in, designed around making frames in an organised professional manner. More importantly, I’m hoping that being in such an inspiring place will help us creatively, and keep progressing as a business at the forefront of the framing industry. Phase 1 has been to move the business from Wharfebank Business Centre, where we have served Otley and beyond over the last 20 years, to the new premises with minimal disruption, whilst keeping up with all orders. This is now nearly complete – and once everything is in its place, we can move onto Phase 2. This will see us promoting the Gallery side of the new premises, and working with artists, to promote their work and build a network of creative people. The new premises just cries out to show-off art work; the really high detailed ceilings, original features and the beautiful light created by the glass atrium all enhance an already inspirational space. We will be hoping to exhibit both renowned artists and community projects, and we are open to new ideas. As we are open all week, it will give more people the opportunity to see the art on display, and put less pressure on the artist to go for the “hard sell”. We are even looking at new ways of selling art, where more money goes directly to the artist. There are lots of ideas at the moment and it’s incredibly exciting – we can’t wait to experiment and try new things. and we’d especially like to thank all our customers. We are so grateful to your continued support: without you guys we wouldn’t be here. Posted on Friday, March 24th, 2017 at 7:37 pm. We are moving to the old council one-stop-shop at the rear of Boroughgate. Below is a map to help you find it. 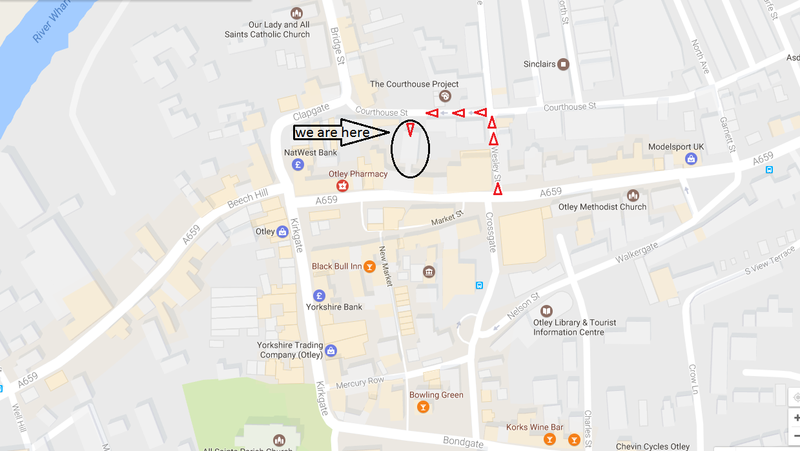 We are opposite The Courthouse, which is an amazing arts and resource centre, and a true asset to Otley. We would highly recommend checking out their itinerary and visiting if you haven’t already. You access the building from the one way Courthouse Street, and we are about half way down on the left. There will be four parking spots and somewhere to lock your bike up right outside the front door, no more secret handshakes to get in on a weekend! (Our existing mill is locked on a weekend). This should make us much more accessible and it will be easier to drop off and pick up your pictures, although we will still help you to your car when you do come in. If you just fancy popping in for a nosey you are more than welcome to do that as well. Posted on Tuesday, January 31st, 2017 at 8:20 am. Firstly, happy New Year and I hope you have survived dry January. The Art Works renovation was quiet over the festive period as we were just too busy doing what we do: making picture frames. But now we have a pending deadline, so it’s full steam ahead! We are so excited to get in and show people the building. It is perfect for us, with its stained glass windows, period features and detailed atrium ceiling. It is going to be a really inspiring and creative space to work in. Sadly, there have been a couple of setbacks, not least in that some delightful person broke in and vandalised the toilets, flooding the place – which was a nice surprise to come back to after the Christmas holidays. But it’s all cleared up now. Onto better things! When we pulled up the tatty, horrible green carpet tiles, we revealed an amazingly beautiful original parquet floor. What were they thinking gluing these awful tiles to this hand crafted floor? Surprises like this make renovating an old building so satisfying. Motivated by this discovery, we’ve pulled up all the tiles and it’s ready to be restored. Later this week, the very talented Evan and Dusty Chris from Bare Joinery will be going to work on it. Can’t wait. There is still so much work for us to do, with all the utilities being installed as if new. First stop is the electrics. Our friends HW Metcalfe, who we’ve known and worked with since the very start of the Art Works, are helping us with this. Fred has been hard at work rewiring and getting the three phase ready for our double mitre saw. Outside, we have a nice trench dug by Nigel Downing(who has been amazingly helpful), through which the electricity supply will come. We just need N.Power to pull their finger out and install the meters so that we can light the place up again. Anyway, that’s where we’re up to – I’ll try to keep this blog up to date with news and pictures from the renovation, and you can check out our Instagram page for regular picture updates . Thanks for everybody’s support and interest. It is still business as usual in the “old place” for now. As soon as we have a date for moving in, we will let you know. It will be in the next couple of months. Don’t worry, we are less than ten minutes away from our current spot, and there is ample private parking right outside the door, and no secret handshake to get in on a weekend (thank you to all the Saturday customers who’ve had to negotiate the main doors!). We are excited to announce we have moved premises. Click here for directions. "Brilliant guys who are exceptionally professionally, efficient and superb customer service. I couldn't recommend them enough and they do all of my personal and professional framing." "Really thoughtful service, end project was exactly what I wanted." © Copyright 2019 The Art Works (UK) Ltd. Company registration: 5994705. VAT Number: 893326791.